A new microchip technology capable of optically transferring data could solve a severe bottleneck in current devices by speeding data transfer and reducing energy consumption by orders of magnitude, according to an article published in the April 19, 2018 issue of Nature. Researchers from Boston University, Massachusetts Institute of Technology, the University of California Berkeley and University of Colorado Boulder have developed a method to fabricate silicon chips that can communicate with light and are no more expensive than current chip technology. The result is the culmination of a several-year-long project funded by the Defense Advanced Research Project Agency that was a close collaboration between teams led by Associate Professor Vladimir Stojanovic of UC Berkeley, Professor Rajeev Ram of MIT, and Assistant Professor Milos Popovic from Boston University and previously CU Boulder. They collaborated with a semiconductor manufacturing research team at the Colleges of Nanoscale Science and Engineering (CNSE) of the State University of New York at Albany. The electrical signaling bottleneck between current microelectronic chips has left light communication as one of the only options left for further technological progress. The traditional method of data transfer-electrical wires-has a limit on how fast and how far it can transfer data. It also uses a lot of power and generates heat. With the relentless demand for higher performance and lower power in electronics, these limits have been reached. But with this new development, that bottleneck can be solved. "Instead of a single wire carrying 10 to 100 gigabits per second, you can have a single optical fiber carrying 10 to 20 terabits per second–so about a thousand times more in the same footprint," says Popovic. "If you replace a wire with an optical fiber, there are two ways you win," he says. "First, with light, you can send data at much higher frequencies without significant loss of energy as there is with copper wiring. Second, with optics, you can use many different colors of light in one fiber and each one can carry a data channel. The fibers can also be packed more closely together than copper wires can without crosstalk." In the past, progress to integrate a photonic capability onto state-of-the-art chips that are used in computers and smartphones was hindered by a manufacturing roadblock. Modern processors are enabled by highly developed industrial semiconductor manufacturing processes capable of stamping out a billion transistors that work together on one chip. But these manufacturing processes are finely tuned and designing an approach to include optical devices on chips while keeping the current electrical capabilities intact proved difficult. The first major success in overcoming this roadblock was in 2015 when the same group of researchers published another paper in Nature that solved this problem, but did so in a limited commercially relevant setting. The paper demonstrated the world's first microprocessor with a photonic data transfer capability and the approach to manufacturing it without changing the original manufacturing process-a concept the researchers have termed a zero-change technology. Ayar Labs, Inc., a startup that Ram, Popovic and Stojanovic co-founded, has recently partnered with major semiconductor industry manufacturer GlobalFoundries to commercialize this technology. However, this previous approach was applicable to a small fraction of state-of-the-art microelectronic chips that did not include the most prevalent kind, which use a starting material referred to as bulk silicon. In the new paper, the researchers present a manufacturing solution applicable to even the most commercially widespread chips based on bulk silicon, by introducing a set of new material layers in the photonic processing portion of the silicon chip. They demonstrate that this change allows optical communication with no negative impact on electronics. By working with state-of-the-art semiconductor manufacturing researchers at CNSE Albany to develop this solution, the scientists ensured that any process that was developed could be seamlessly inserted into current industry-level manufacturing. "By carefully investigating and optimizing the properties of the additional material layers for photonic devices, we managed to demonstrate state-of-the-art system-level performance in terms of bandwidth density and energy consumption while starting from a much less expensive process compared to competing technologies," says Fabio Pavanello, a former postdoctoral associate from Popovic's research group who is a co-first author of the paper with both Amir Atabaki, a research scientist at MIT, and Sajjad Moazeni, a graduate student at UC Berkeley. "It took a major collaboration over several years by our three groups across different disciplines to achieve this result," adds Atabaki. 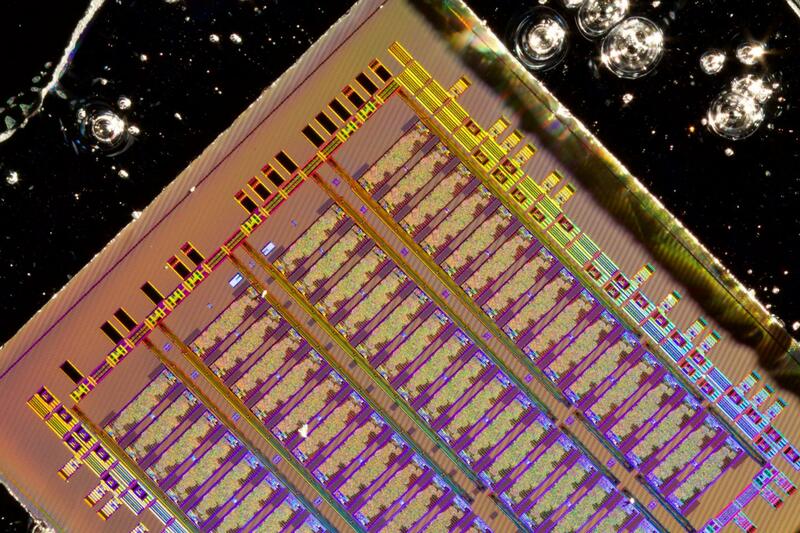 The new platform, which brings photonics to state-of-the-art bulk silicon microelectronic chips, promises faster and more energy efficient communication that could vastly improve computing and mobile devices. Applications beyond traditional data communication include accelerating the training of deep-learning artificial neural networks used in image and speech recognition tasks, and low-cost infrared LIDAR sensors for self-driving cars, smartphone face identification and augmented reality technology. In addition, optically enabled microchips could enable new types of data security and hardware authentication, more powerful chips for mobile devices operating on 5th generation (5G) wireless networks, and components for quantum information processing and computing. "For the most advanced current state-of-the-art and future semiconductor manufacturing technologies with electronic transistor dimensions below 20nm, there is no other way to integrate photonics than this approach. ", concluded Vladimir Stojanovic, whose team led some of the work, "All of the material layers used to form transistors become too thin to support photonics, so the additional layers are needed." High-resolution photos available by request.